Did you hear about Monstroid, a new multipurpose WordPress theme that was released on July 22? One month after its official launch the theme has been downloaded for more than 1000 times already! People are ready to pay $79 just to put their hands on this beast. Today you have a unique opportunity to grab it for FREE. 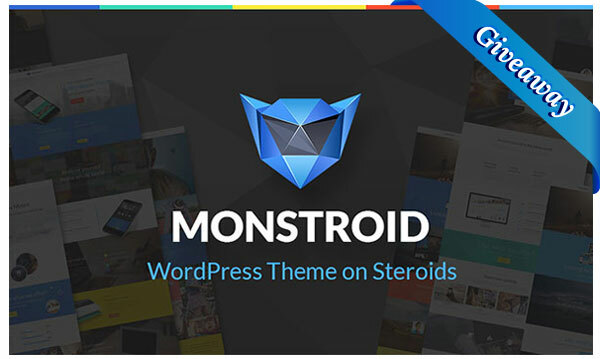 Monstroid is a powerful multi-purpose Wp theme that includes a variety of features that can be used by both expert web developers and common WordPress users. One of the things that Monstroid customers enjoy the most is its set of child themes that comes together with the theme. The gallery is expanded with 15 new topics monthly. In such a way, you will get more than just one cool design. Dozens of other, not less powerful, WordPress templates will be at your disposal as well. Additionally, the pack includes such well-known premium plugins as MotoPress Editor and MotoPress Slider that you will get at no cost. Free live chat support that is available right from the dashboard, lifetime updates for each Monstroid theme, 23+ awesome plugins, Cherry Framework 4.0, 50+ free licensed images, 120+ PSD files, Monstroid Installation Wizard, and loads of other stunning options were included in the pack. It’s not difficult to find Monstroid user reviews on the web. What’s more, the code of Monstroid has been checked by themereview.co, and you know that these guys are among the leading WordPress theme reviewers whom we can trust. Here are some of the highlights with Monstroid customer reviews. I am not a web developer and, frankly speaking, playing around with code is not my cup of tea. That’s why, a ready-made website template with an intuitive dashboard and the possibility of layout modification by simply dragging and dropping different elements is just what I need for my future project. I needed a WordPress theme for my personal portfolio. When I came to templatemonster.com and looked though the gallery, I decided that it would be a reasonable investment to pay $79 for Monstroid and get access to dozens of other cool designs. Among the features that were of special use to me I can highlight Installation Wizard, MotoPress Editor and Slider, shortcodes, a separate typography page with unlimited typography options, and a stunning Portfolio section, of course. The opportunity to upgrade my portfolio website with some cool child themes without paying extra cash is very, very tempting. Great job, TemplateMonster! You get 5 stars from me! I have just started my own website and have never done anything like this before. The installation was easy and having the MotoPress editor made things so much easier for me, I work better at a visual editor rather than code as i’m just starting out. Using Monstroid template and making it my own was easier than starting from nothing, I was able to customise it without too much hassle. I did find an issue that some parts weren’t responsive when looking on my mobile phone but I was able to look at a similar item and correct the problem myself. This template is great if your starting out or professional. When my business grows and I get better at customising Monstroid this will be extremely useful to grow with my online needs. Go to this page and examine the features of Monstroid in detail. Submit a comment to this post and tell us why you want to win Monstroid. The giveaway starts on August 26th and ends on September 2nd, which is exactly one week. After the giveaway is over, we’ll randomly pick 3 lucky winners and send each of them a free license of Monstroid, so you’d better hurry up! Take your chance to grab this monster for free. Hi there! I’m Fernando from Brazil!!! Well… I’ve seen hundreds of great themes all over the web last 2 years (i’m addcited to see themes) so i really dare to say that nothing compares to Monstroid. Really! That’s what i think, no matter if i will have it or not. Short words: Monstroid is a collision of everything is possible to think to have on a website simple or high level. I think it fits for dozen or hundreds of purposes, business or personal. A real multi purpose for sure. -LIFE TIME UPDATE – IT´S SO IMPORTANT !!!! My biggest congratulations to all mebers of that criation. It’s an art. Hi! I’m interested in the “Monstroid Features for DIY Guys”. Being a graphic designer who know nothing of how to use coding to built a website, this features is the most important tools to built a website for a beginner like me! I really need this theme! I want to win Monstroid because its beautiful and extremely functional all in one WordPress theme. It seems that the code is really well written, in fact pages are very quick to load. Plus I think Monstroid is usable at 360°, thanks to its versatility and ease of use. Hello, the theme is just awesome, and a modern design concept with many options and several embedded layouts. This is already mine! The name Monstroid does this theme justice. It’s limitless feature allows a wide range of people to tinker with its functions and features. Whether youre a web dev or simply a design visionary, Monstroid seems capable of being transformative to a handful of needs. All in its a beautifully crafted theme that I’d love to utilize. Beautiful theme with tons of features. Excellent plugins. Variety of child-themes. This theme has everything a designer looks for. I would like to use this theme for my own portfolio. Excellent giveaway. I liked the Team section the most. It has a lot of options within it. I have seen many clients asking to neatly present their teams. There are some free plugins that I have used earlier but an in-built module like this would be the best option to go with. I’d love to win this theme to experiment with it and perhaps introduce it to my clients and others. The flexibility makes it a no brainer for creating an identity not everyone out there has. All the short codes, sliders and layout options are linked in an easy to configure way. I think you’ve hit a home run with this one! I think I need it … White Label Plugin and child themes make it a tool that I would love to work with. And The MONSTROID goes to…………… MEEE!!!!! TemplateMonster ‘n Design Bolts are Rock ! !